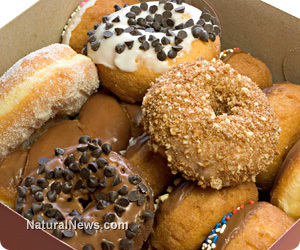 (NaturalNews) It certainly will come as no surprise that eating processed junk food is detrimental to your health. Few people may realize though that sugary sweet foods and highly processed wheat fortified breads, pasta and sweets actually change brain metabolism in a similar manner to opiates and narcotics. This may help explain why so many people feel addicted to their favorite junk food splurge, and the reason that food manufacturers employ a team of chemists to fabricate most snacks to encourage repeat purchases. A team of researchers from the New Balance Foundation Obesity Prevention Center at Boston Children's Hospital have reported their findings regarding processed carbohydrate consumption on brain metabolism for publication in The American Journal of Clinical Nutrition. The scientists have determined that highly processed carbohydrates can trigger the same brain mechanism associated with substance addiction. High glycemic foods typically found in snack foods and breads trigger hunger shortly after eating, and stimulate regions in the brain associated with reward and cravings. At the outset of the study, lead author, Dr. David Ludwig noted "Beyond reward and craving, this part of the brain is also linked to substance abuse and dependence, which raises the question as to whether certain foods might be addictive." Ludwig and his team evaluated 12 obese or overweight participants and measured levels of blood glucose and hunger. Each subject underwent a functional magnetic resonance imaging (fMRI) to observe brain function and activity during the four-hour period after eating, a phase known to drive eating behavior and our desire to eat. Participants were given two types of milkshakes, each containing the same number of calories, taste and levels of sweetness. One of the shakes contained high-glycemic carbs (fast-releasing carbohydrates) while the other had low-glycemic carbs. Those receiving the high-glycemic shake experienced an initial blood sugar surge followed by a corresponding crash approximately four hours later. When viewed on an fMRI, the blood glucose crash was accompanied by overwhelming hunger and intense activity within the nucleus accumbens, a region in the brain involved in addictive behaviors. Dr. Ludwig concluded "These findings suggest that limiting high-glycemic index carbohydrates like white bread and potatoes could help obese individuals reduce cravings and control the urge to overeat." Past studies have implicated wheat-based foods with compulsive feeding characteristics, as the gliadin protein found in wheat encourages addictive behavior similar to opiate addiction in sensitive individuals. Elimination of processed snack foods, pasta, breads and sweet treats will minimize the addictive behavior associated with junks foods to assist with weight management and disease resistance.